Pope Francis is making us uncomfortable. And that's a good thing. 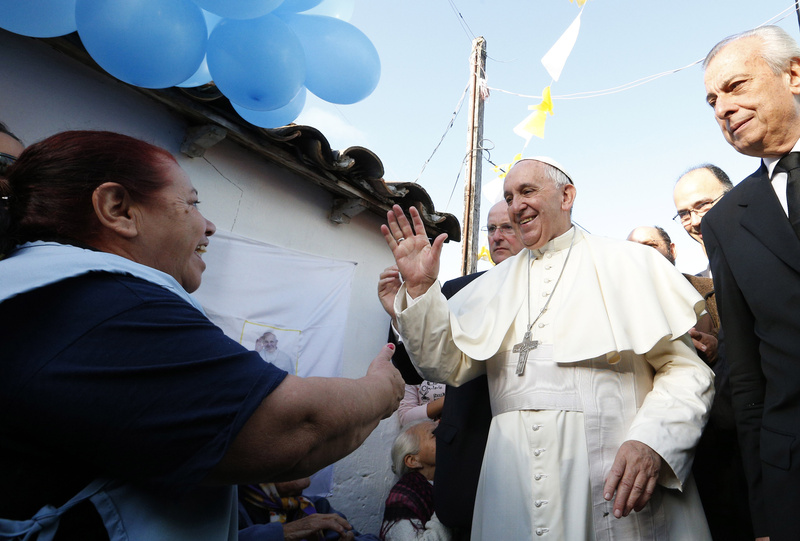 Pope Francis has spent much of his papacy embracing people. He’s visited slums and welcomed immigrants; he’s worked to include people from the margins and made an effort to live a simple, humble life. This has made a lot of us feel pretty good about him and about the church. “Ours is a church that cares about the poor! Ours is an inclusive and loving church! Just look at our pope!” we cry. The ubiquity of these images of the pope and his lived expression of the Gospel have in some ways allowed us to think that he is in the process of single-handedly solving the world’s problems. This is a comforting thought. But while Pope Francis is trying to encourage a more just, generous and merciful world, he isn’t planning to do this on his own. Over and over Francis has called each of us to join him in caring for the poor and the sick, to visit prisoners, to help those who are homeless, to embrace others and to reconsider how we build our society, how we spend our money, time and resources. And it seems the world is beginning to realize that all the hugging and the talk of the poor and vulnerable and the economy is not a papal PR campaign but an authentic call to live a Gospel that might just require the rest of us to (gasp!) change our lives. And that’s making many people uncomfortable. A recent Gallup poll reported that Francis’ popularity has fallen steeply among U.S. adults (76 percent favorability in 2014 to 59 percent in 2015), and particularly in conservative circles (72 percent favorability in 2014 to 45 percent in 2015). A Gallup analyst suggested that this may be “attributable to the pope's denouncing of 'the idolatry of money' and linking climate change partially to human activity, along with his passionate focus on income inequality— all issues that are at odds with many conservatives’ beliefs.” Yet urging care for the poor and the earth is nothing new for the church, which has been on message about this for some time. Francis didn’t invent these ideas, he’s just made them harder to ignore. In other words we are used to hearing opinions and voices that we “like,” and can easily avoid anything that we dislike, which too-often is synonymous with what challenges us. This inclination is understandable, but each of us should work to resist it. True dialogue can be difficult and painful. But a lack of dialogue is worse. When we are unwilling to truly encounter and consider opinions that challenge us, it becomes all too easy to label the individuals who hold those opinions as enemies or opponents—to view them unfavorably. And after surrounding ourselves with words of affirmation, the challenge that Francis offers us might be that much harder for us to accept. True dialogue requires humility. If we want to respond to the Gospel call to mercy, we have to be willing to acknowledge that this call might summon us to unexpected places, and might come from someone very different from ourselves. It might jar us, challenge us, surprise us. And we might not like it. Most of us like to think that we do our best each day to be good people, or good Catholics. We go to work and care for our families and maybe watch some Netflix and say our prayers before bed. And maybe most of us really are quite literally doing all we can with the time we have. But if we’re honest with ourselves, most of us can do something more. For some of us that might mean seeking out volunteer opportunities that help us to connect with those in need, or donating food or clothes or money. But this “more” can also mean simply being more present and deliberate in the good works we already do—acknowledging and lifting up the hours worked, the meals prepared and the rides to soccer practice as moments of mercy in and of themselves and seeing these everyday moments as opportunities for true encounter and real grace. The Gospel is meant to challenge our daily actions as well as our hearts. And it is quite literally Francis’ job to remind us of that, like it or not. An article “Will Francis change the Vatican?” on the National Geographic website based on interviews with people who know him well suggests that Francis understood from the beginning that he would make great changes, that they would be practical rather than doctrinal, that he knows he has a limited time, and that he plans things carefully. My hunch for sometime has been that he plans to do four things to facilitate our reunion with the Orthodox. Two are already apparent: a practice of synods in the Western Church more similar to that of the Eastern Church, and a practice in dealing with the divorced that will make us more similar. There are two others about which there have been hints : allowing a married priesthood similar to that of the Eastern Churches, and approving the deaconate for women (the Orthodox have already done this in principle though only a handful of women have been ordained). Francis could facilitate both of these simply by deciding on his own to give the authority to National Conferences of Bishops to request either or both, and convening a Synod to decide how Rome should process the requests, e.g. how much variation among countries should be allowed. Paul VI reserved the issue of celibacy to himself; Francis could merely give it back to the bishops. There have been several studies of women deacons, mostly about how similar or dissimilar they were to male deacons, Francis could simply say that the early church had women deacons, and it is up to bishops conferences to decide how similar or dissimilar the ministries of male and female deacons should be in their territories. All of this would do what Francis likes to do, initiate changes that will take us beyond a place of return, and that they will be very substantial in practice rather than deeply doctrinal. Supposedly he plans to return to Argentina. I can imagine him being very happy at the ‘mess” he will have left for everyone to figure out for quite some time. This is excellent, and very hopeful, and I hope you are right. Very thoughtful comments. Just one small but important point Jack. When Pope Francis was reported as saying he "wanted a mess" it was a mistranslation of the Spanish "hacer lio." According to Francis' biographer Austen Ivereigh, in Argentina that phrase means "to go out into the streets to bang saucepans and shout at the top of your voice" to indicate "exuberant passion for a cause." A good clarification! Francis himself is making a "mess" in his own way of being exuberantly passionate about things. When he has talked about young people making a "mess", he has also done it with apologies to the Bishops because they will have to respond to the noise, and do something about causes involved. So he is making a "mess" in these two senses. And his vision of synods is that they need to be the bishops and the people together not just the pope who become passionate and do something. I agree that Francis is not making a mess in the sense we often use it, e.g.creating chaos and destruction for their own sake. Pope Francis is a real man of the people. He has captured their hearts, but he will never fully capture their minds until women can have a real leadership position in the church, until gays, and their children, are not descriminated against at churches, catholic schools and catholic hospitals, until he drives out all the Cardinals and bishops connected to the abuse crisis in any way, who still have leadership positions, and until he fires any church leaders who play politics, while opposing him, and the people, on matters of the environment (Laudato Si') and other issues. No one knew anything about the popes until the age of mass communications, perhaps after WWII. Now everyone seems to have an opinion about the current pope or the last few popes. There is more to the church than the pope and the pope is more important than many a world leader with more divisions and bombs. But I doubt most Catholics are deeply concerned about what the pope says and does; it is a curiosity. If my last heard homily was correct and 65% of US Catholics do not believe in the Real Presence in the Eucharist -- how can one think American Catholics care about the pope? He seems different and that is exciting, not another lean and mean ascetic like Pius XII or Paul VI, but a real flesh and blood man. But that is the only reason for attention to Francis, like John XXIII he is so unlike the popes in general; he is fat and rolly polly, eats too much pasta and pays little attention to his doctors or his courtiers. If he can do something permanent to free the church from the integrists and clericalists good, but he could well be poisoned in traditional Italian fashion. The church needs a good dose of plain anti-clericalism and it is unsettling for many that that might be supplied by a pope. So, more power to him.